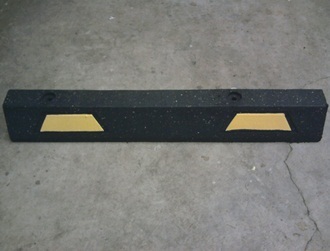 Our 3 ft Rubber Garage Parking Stop with 2 yellow stripes helps drivers know when to stop. Tough, recycled tire rubber is resistant to weather, salt, moisture, UV, oil and temperature. Will not warp, chip or crack. Reflective stripes are made of road marking tape. Easy, one person installation (instructions included). Installation hardware is available but sold separately. Two yellow stripes on each side. Please see below for asphalt and concrete installation hardware. Please call for freight quote on multiple quantities. Dimensions: 6" W x 4.25" H x 3 feet L.
3. Put rubber wheel stop in place. Put washers in place. 3. Put product in place. Put washers in place. 2. Put rubber wheel stop in place. Mark perimeter and drill holes. 6. Apply adhesive to bottom of wheel stop. Set in place. 8. Allow setting and curing time according to adhesive directions. Please note if you remove parking stop installed with adhesive, you are likely to tear the wheel stop or the surface. Go to top of this 3 ft Rubber Garage Parking Stop with Yellow Stripes page.